Aiken County's Crackerneck Wildlife Management Area and Ecological Reserve will be open to the public on the first three Saturdays during the month of March (5, 12, and 19). The final Saturday (March 26) will be reserved for a youth turkey hunt. The Crackerneck Wildlife Management Area (WMA) and Ecological Reserve is composed of 10,600 acres owned by the U.S. Department of Energy. The area is located in Aiken County, along the Savannah River and south of the town of Jackson, off SC 125. Access is through the check station gate off Brown Road. Detailed maps/brochures of the area that include special rules and regulations can be requested in advance by e-mailing caudellm@dnr.sc.gov and providing a name and postal mailing address. Maps are also available at the check station where visitors sign in. The S.C. Department of Natural Resources (DNR) office on the Savannah River Site can be reached at (803) 725-3663. The area will be open for scouting, fishing and some other outdoor activities. All visitors must sign in before entering and sign out prior to leaving. No managed trails exist on the property. Bikes and horses are confined to the 50-mile road system and selected firebreaks. No weapons are allowed during this period. Hours are 6 a.m. to 8 p.m. Insect repellant is recommended for all users and recreationists should bring their own water. One port-o-let is located at the check station. Hunters are encouraged to utilize these open dates to scout the area prior to turkey season. Habitat changes are continually occurring due to timber harvests, prescribed burns, weather events and road construction. Fishing will be allowed during this period. At Skinface Pond, the bass limit is two per person per day with a 14-inch minimum, catfish are five per day and the bluegill limit of 30 is the same as state creel limits. Limited bank fishing opportunities are available at Skinface so a small boat is recommended. In addition, a couple of swamp lakes are accessible with small boats. Great opportunities exist for birders to view spring migrants and winter or permanent residents. Birding for terrestrial, species is productive and easy due to the road system that traverses a variety of habitats. Wetland species occur, but are difficult to access and observe. 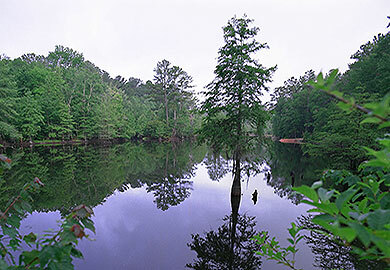 South Carolina DNR personnel at the gate can provide locations for species of interest. Many people just enjoy touring the road system to see what can be observed, whether it be wildlife, wildflowers, old home sites or cemeteries, forestry and wildlife management practices. The entire 50-mile road system can be enjoyably ridden in under four hours. All roads, including jeep trails, are maintained in excellent condition. Photographers have grand opportunities with wildlife, wildflowers, scenic vistas, and forestry and wildlife management practices to name a few. However, photographers should have realistic expectations when trying to photograph wildlife. While abundant, wild animals at Crackerneck are truly wild and elusive. Stealth is necessary for success. Most animals are more active at dawn and dusk rather than mid-day.